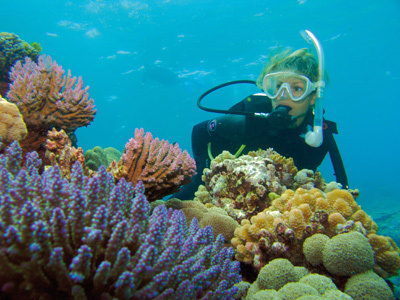 Cairns day dive trips to the Great Barrier Reef are comfortable cruises on large seaworthy catamarans that travel to remote areas of the Great Barrier Reef where activities such as scuba diving and snorkelling can be conducted with safety. Divers are all accompanied by skilled and experienced diving instructors and safety boats are on constant patrol taking care of frollicking snorkellers. There are many dive sites to choose from so you won't be diving in the same place too often. This cruise provides an element of luxury and a high saff to passenger ratio to ensure that that your memories of your reef encounter are as good as they can possibly be. This vessel is a custom built dive platform with great scuba equipment stowage design and ample space for divers to dress. The hydraulic rear platform makes water entry a breeze and there is plenty of fresh water for washing down after your dive. The trip to the reef is comfortable and relaxing. Introductory divers will learn the basics of using the dive gear from fully qualified and experienced Diving Instructors whilst underway. The coral reefs when you are diving Cairns are pristine and beautiful abounding in colours and varieties of fish and other marine animals. Cairns diving departures are daily with over 5 hours to explore marine life and coral formations in any 3 of 18 dive sites selected for their uniqueness and beauty. Cairns $27pp return, Northern Beaches $33pp return. Enhanced "Ride Control System" stabilisation for the smoothest ride. Just the best day on the water you will find anywhere in Queensland. Afternoon Tea: Tea and coffee, cheese and crackers, cake. There is a licenced bar on board. in Australian dollars include Goods and Services Tax. Prices valid to 31 March 2018.